oh my CUTE!!!!!! 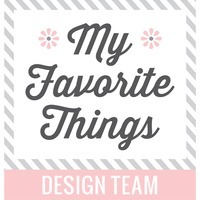 So many fabulous projects! I love... penguins, and the bakgrounds are so pretty. TFS. Wow! So cute and so much fun. I love them all. I really like the layered tree. I think I need that die set. Looks like I'll be adding to my ever-growing collection of penguins! Amy, your cards are precious... especially this little sweetie nestled in the pine boughs! Love the penguins! And, the layered tree is calling my name. Your cards are adorable. So, so cute! I LOVE these penguins! Thanks for sharing!! Those penguins are adorable! 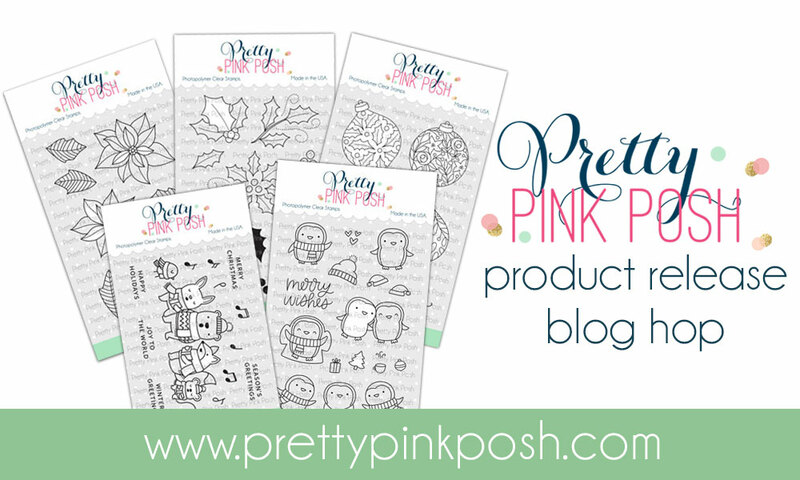 Love your coloring & project. OMG! 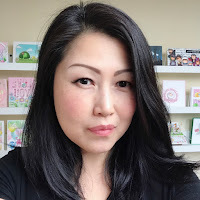 Your cards are soooo great - I really like how you put them together! My fave has to be the layered tree....I must get that!! Oh my gosh, these are all awesome, the little penguins are so cute! is the cuties sitting in the wreath; love that card! The penguins are soooo cute. OUR college mascot is the Penquin, I am always on the lookout for them! Adorable penguins!! Love your coloring! 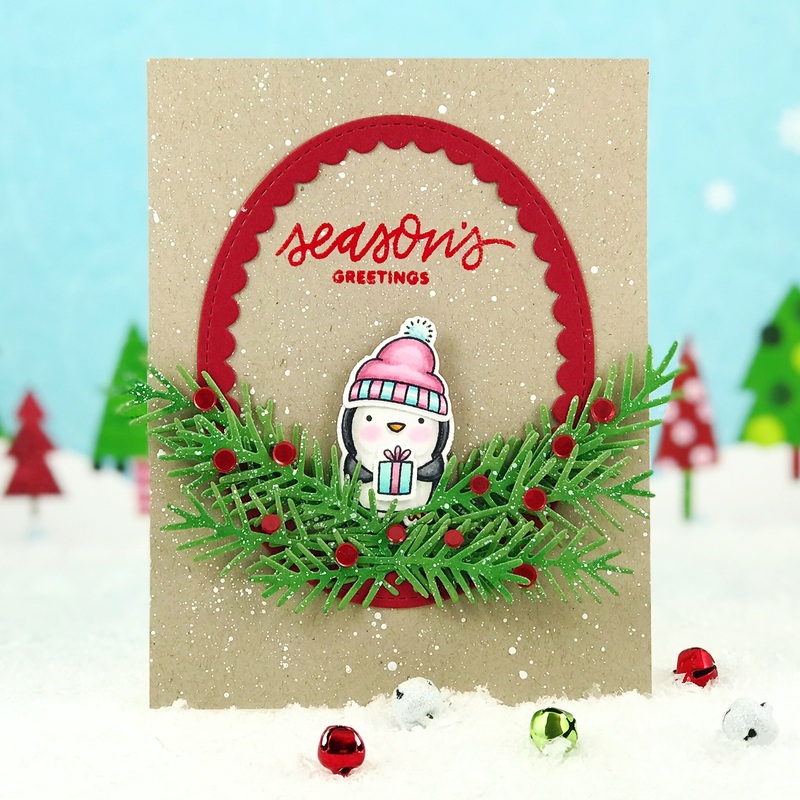 Beautiful and totally adorable cards, I am in love with that Christmas tree die! Adorable cards! I sooooo love that layered Christmas Tree it is so pretty with all of the little gems all over it! Love your cards and this release looks like fun! WOW! Your cards are just too cute! 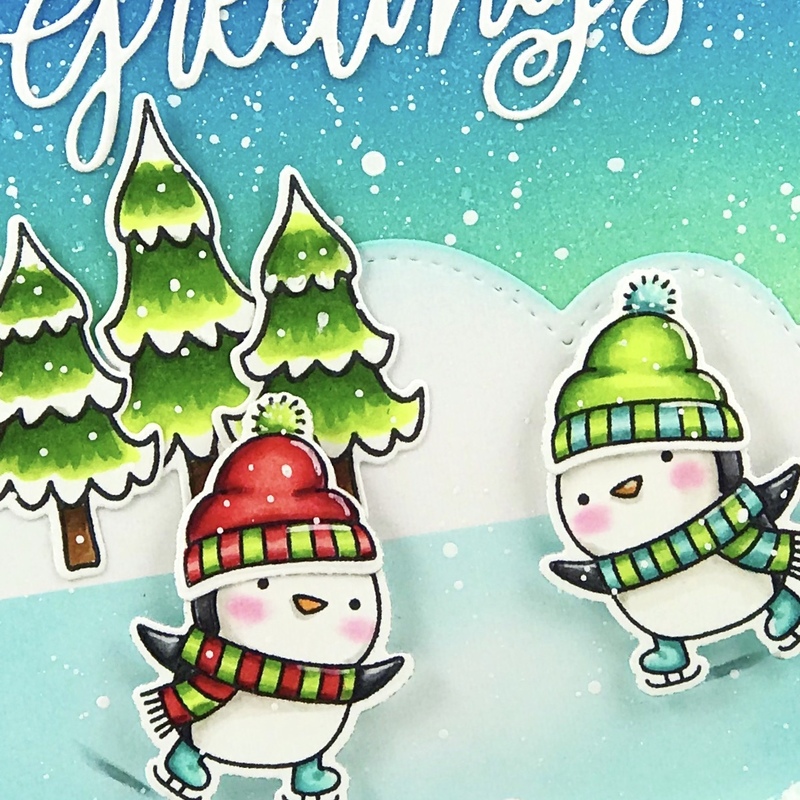 Fabulous card designs with these cute penguins and I like your coloring. Eek, so cute! I love it! Such sweet cards. Love the penguin and those sequins on the tree boughs sure add great sparkle. Nicely done. These cards are so beautiful! I'm in love with that Season's Greetings scripty word die. penguins are by the best stamps totally love your cards. Darling scenes! I love the gems on the tree! Love the layouts of your cards. They are so cute. Love these cards and the entire release - especially the penguins! Oh my! I just love penguins. There are the cutest. Love your card. I just want to squish these penguins chubby little cheeks! Also, I really appreciate seeing how to take individually colored images and putting them into scenes and finished cards. I tend to get lost in the muck on that step. Thanks for sharing! Oh these are so cute! I love them and that tree is gorgeous! Love the fabulous cards. The penguins are adorable. Awww these are the most adorable cards!!!! Those penguins are so cute, I love your fun and festive cards. These little guys are sooo sweet! Oh my!!! What adorable scenes!!! Your cards are so sweet and cute!!! All three of these cards are just so sweet! I love your snowy backgrounds. And those penguins look so cuddly! Your penguin cards are super ADORABLE! I love them all! Thank you for sharing how you made them. 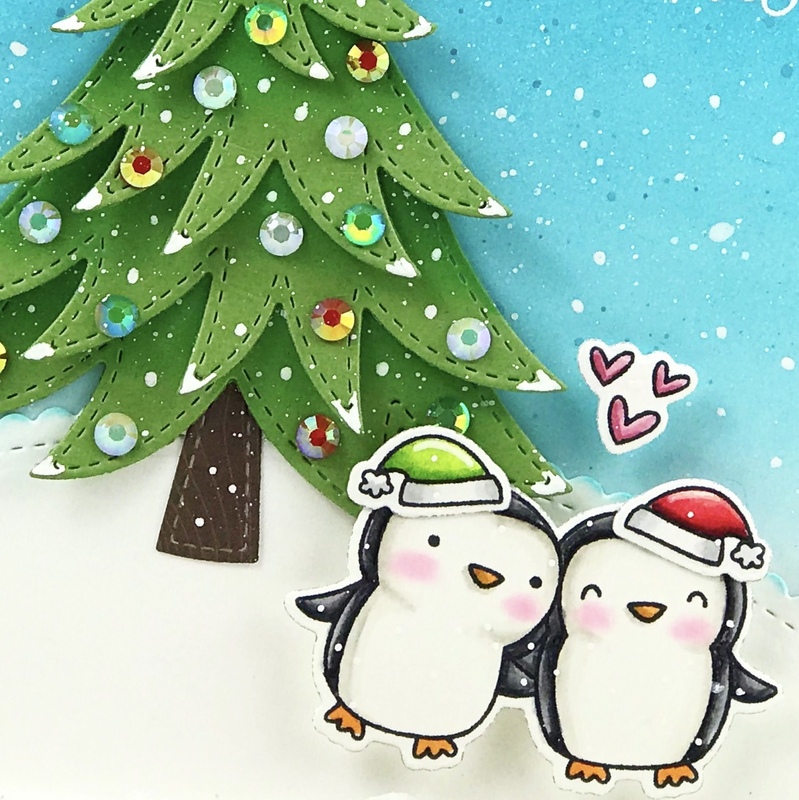 Your Penguin Pals are soooooo adorable and love how you paired with so many of the die cuts and beautiful scenes!!! Gorgeous work!! These cute little penguins are so much fun! I love your color combinations too! I really like the pine sprigs, really versatile! You've made some stunning cards! The little penguins are darling. at the base of the oval. These cards are all so wonderful; I really can't decide which one I love the most. I really adore the rich colors on the first two cards, and those penguins are just the cutest critters ever! So sweet and cute, Thanks for sharing your work with us. The ice looks fantastic! Penguins are always cute!!!!! So many cute penguins!! You do great work with your backgrounds. I love how you do them. They are stunning. I love that layered tree die-cut. The penguins are so whimsical, and the card with the penguin sitting among the pine sprigs, is a super layout. These penguins are adorable and you've created some wonderful scenes for them. The penguin nestled amongst the pine sprigs is my favorite! So cute! So adorable. I love how cute these penguins are!!! Oh what adorable cards! 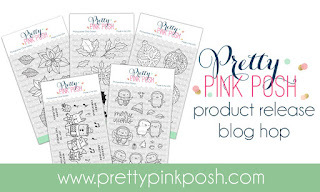 Gorgeous coloring and I love the layers and dimension on your cards. You did a great job on all your projects! All your cards are so cute!!! All are fantastic, many ideas, love penguins. It's time for me to get started...time is short. all your cards are so sweet. The penguin set is adorable. Your cards are so whimsical and full of life! It cheered me up by just looking at these sweet PPP penguins' smiling faces!!! What a fun set of cards you've made. Thanks so much for sharing them. These penguins are cute as can be! Adorable cards! 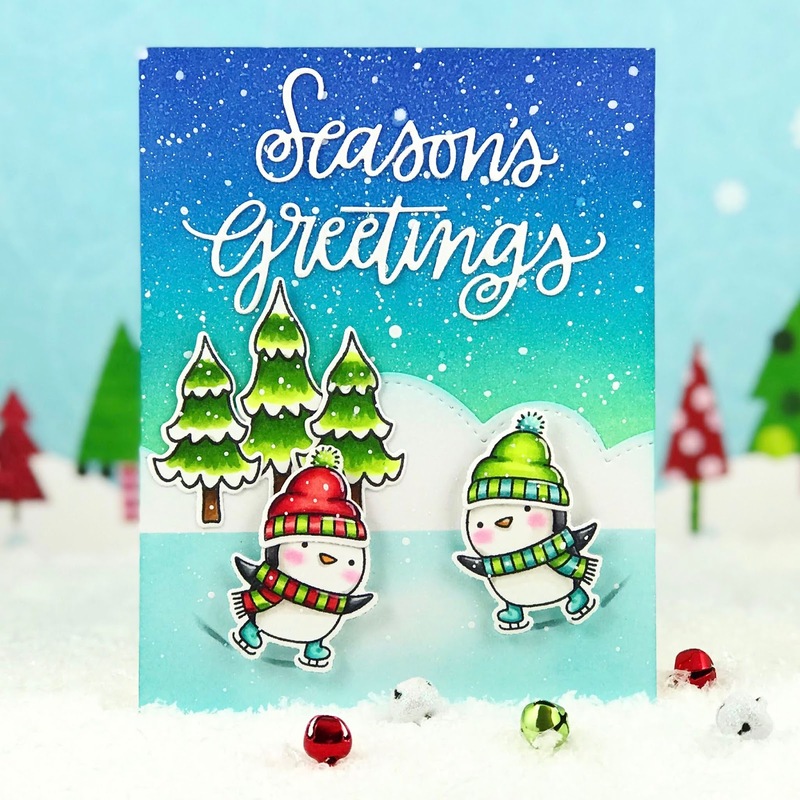 Super festive and fun cards, cutest penguins ever! Wow....you made three amazing card. All three cards are fabulous! Loving these penguins! Cute cards! Love those sweet cards. Those penguins are the cutest ever! These are all adorable! I love the penguins, but I think my favorite is the first one. I love the color blending on the sky and the ice!!! Oh my goodness, Amy, your cards are fabulous! 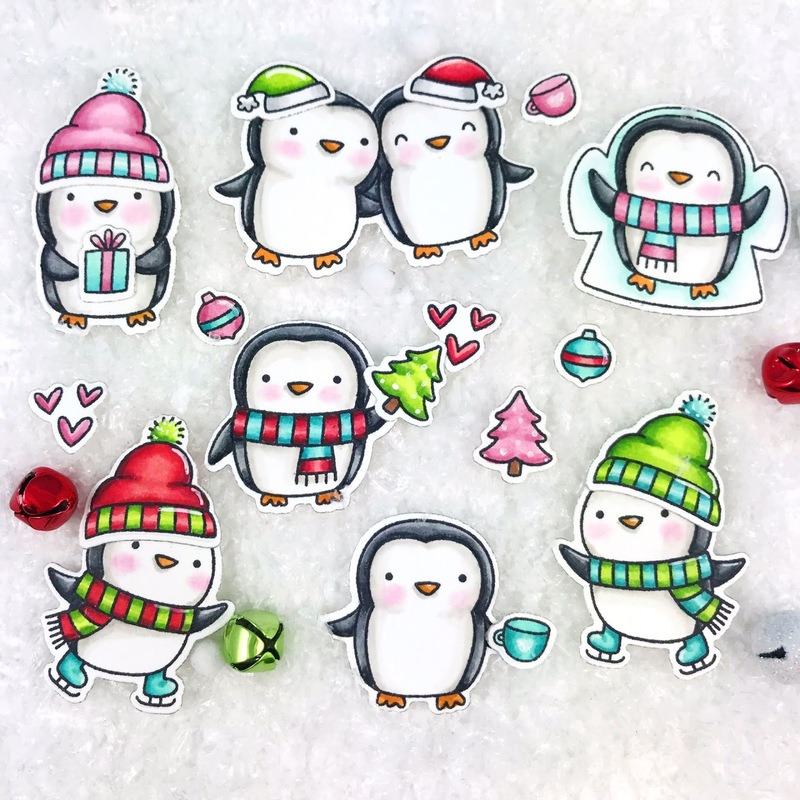 Love these festive penguins and the way you colored! You've really brought these penguins to life - I just want to grab them and snuggle them! So much cuteness! Your cards are fabulous. these are ADORABIBBLE CARDS!!!! i really like the pine sprigs and the trees - but the PENGUINS!!! These are all so adorable!!! Love these sweet penguins and your fabulous coloring!! 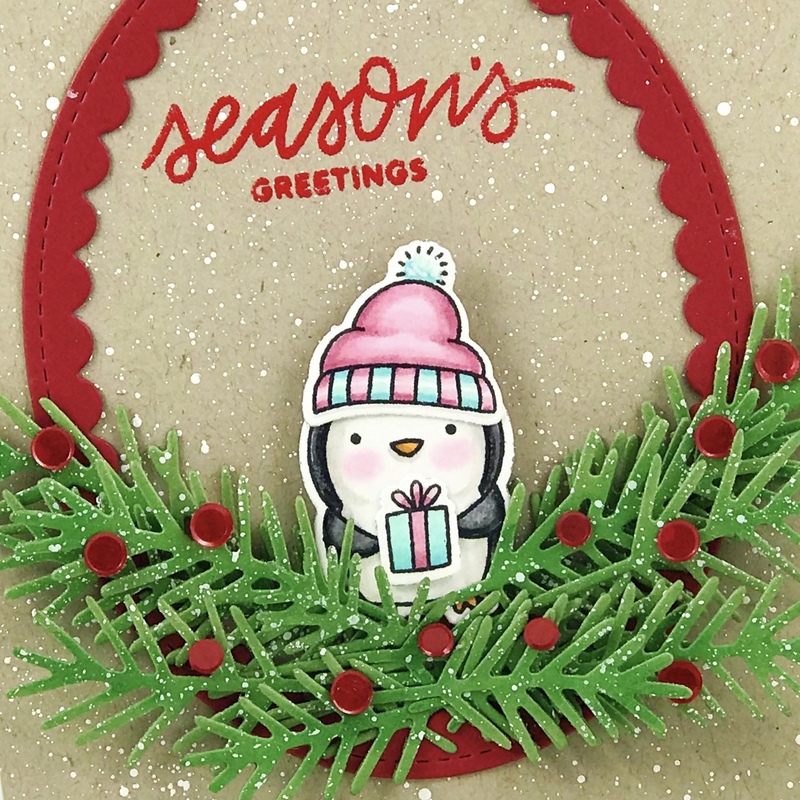 These cards are wonderful with the sweet penguins and great die cuts. I love how bright and colorful your cards are! Those penguins are fabulous that you colored!